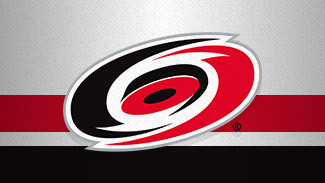 Who will make an instant impact for the Carolina Hurricanes in 2012-13? Two seasons ago, it was forward Jeff Skinner. Last season, defenseman Justin Faulk burst upon the scene as a first-year pro. 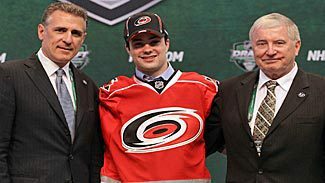 "Timing is everything," Carolina's director of amateur scouting, Tony MacDonald, told NHL.com. "You have to be careful, because Skinner and Faulk are the exceptions rather than the rule. It doesn't happen often. When you draft a player in the first or second round, you're not really expecting to see them in your lineup for two or three years … it doesn't happen that often where they jump in and have an impact early on. "We might be a little spoiled by what [Skinner and Faulk] have done, but there's always a chance a player could have an impact in his first year." There are several candidates within the pipeline expected to challenge for considerable playing time this season. Despite losing one of their more promising prospects, Boston College defenseman Brian Dumoulin, who was part of the deal that brought Jordan Staal to Carolina, the Hurricanes appear to be stocked on defense. There's also a nice stable of forwards hoping to impress at the team's training camp in September. "It's going to be tougher for a young forward to crack the top six now [after the acquisitions of Jordan Staal and Alexander Semin]," MacDonald said. 1. Ryan Murphy, D: The No. 12 pick in the 2011 NHL Draft missed some time after suffering a concussion in November while playing for the Ontario Hockey League's Kitchener Rangers. Tremendously gifted offensively, Murphy did finish with 11 goals and 54 points in 49 regular-season games and two goals and 22 points in 16 playoff matches. His play helped Kitchener reach the third round of the OHL playoffs. "I think he could challenge for a spot on the big club," MacDonald told NHL.com. "It would not be the end of the world if he went back to junior to play another year, but I think he's ready for the challenge of stepping up and trying to win a job at the next level." Murphy, as dynamic an offensive prospect at the position as there is, will undoubtedly one day have an impact as a power-play quarterback for the Hurricanes. "Murph has worked with [Hurricanes athletic trainer] Peter Friesen this summer to try and get stronger and prepare himself for an NHL team," MacDonald said. "He's not a real big guy, but relies on his speed. He has to get bigger and stronger in order to compete at the NHL level, and hopefully he's ready to do that." 2. Zac Dalpe, C: A lower-body injury in training camp put a wrinkle in Dalpe's plans last season when he managed one goal and three points in 16 games with Carolina. Despite that fact, the Hurricanes haven't given up hope on their 2008 second-round pick. "He's always had a nice balance wherever he's played and whether he skated on wing or played center," MacDonald said. "He has skill, speed and a shot, and that's what he's going to have to show us if he intends to crack an NHL lineup on a regular basis." Dalpe, who has four goals and seven points in 31 career NHL games, did produce 18 goals and 32 points in 56 games with the American Hockey League's Charlotte Checkers last season. Carolina will need a third-line center if Eric and Jordan Staal are placed on the same line, as is expected, at the start. This could be Dalpe's chance to prove he belongs. 3. Drayson Bowman, LW: A wing with good two-way instincts, Bowman is not afraid to get his nose dirty in the tough areas on the ice. "Drayson is a much better two-way player than he's given credit for," MacDonald said. "He spent time in Carolina last year and showed he could play a responsible two-way game. He's at a point where he's ready to take that next step to full time duty, but it's certainly going to be up to him. He'll have to impress the coaching staff enough to allow them to believe he's ready, and I believe he is." Bowman, who signed a two-year contract in July, split the 2011-12 season between Carolina and Charlotte. The 2007 third-round pick connected for a career-high six goals, seven assists and 13 points in 37 games with the Hurricanes last season. 4. Jeremy Welsh, C: The 6-foot-3, 200-pound free agent out of Union College signed a one-year deal with the Hurricanes in April and played in the team's regular-season finale. "He made a cameo appearance at the end of the season and handled himself well, so he's in a position to win himself a spot," MacDonald said. "He's a physical specimen with a great attitude and work ethic, and I think that's why we're excited to have him." Welsh spent the past three seasons at Union, totaling 53 goals and 100 points in 119 games. He produced 27 goals and 44 points in 40 games in 2011-12, including five goals and nine points in eight playoff games as Union made a dramatic run to the Frozen Four but lost to Ferris State in the NCAA semifinals. 5. Victor Rask, C: The big Swede's first season in North America was a success playing for the Calgary Hitmen of the Western Hockey League. Rask finished second among rookies with 33 goals and third with 63 points. His 14 power-play goals tied him for 15th in the league. The 2011 second-round pick didn't participate in the WHL playoffs after going down with a knee injury in the regular season finale, but the future appears bright. "If he comes in and has a great training camp and forces the coaches to look at him as a potential regular on the Hurricanes this year, that would be great," MacDonald said. "We might be more inclined to return him to junior than [begin his pro career in] Charlotte, but that's a decision we'll make over time. Returning to Calgary for one more year and dominating at the junior level would not be a bad option." At this stage, the 6-2, 194-pounder, who signed a three-year entry-level deal in October, could use another year to mature and improve his skating in an attempt to enhance his long-term chance of becoming an impact player for the Hurricanes. 6. Bobby Sanguinetti, D: Upon signing the 6-3, 190-pound blueliner to a one-year, two-way contract in May, Francis said, "[Sanguinetti] has put himself in a position to challenge for a spot on our roster this season." He enjoyed a productive year in the AHL with Charlotte, ranking third among all defenders with 40 assists and 50 points. He also earned a late call-up to Carolina, appearing in three games. Now would be the time for Sanguinetti, 24, to earn his place in the lineup. A first-round pick in 2006 by the New York Rangers, Sanguinetti has played in eight career NHL games and has no points. "He's had some injury issues that have held him up and not allowed him to put his best foot forward," MacDonald said. "If he can remain healthy and play his game, while showing consistency and confidence, he should be in a position to challenge for a spot this year and maybe make the team." 7. Riley Nash, C: Nash finished with eight goals and 20 points in 58 games with Charlotte last season and will be in the mix to earn a possible fourth-line role with Carolina in training camp in September. Nash, who was acquired in a trade with the Edmonton Oilers in 2010 and has proven effective in the faceoff circle, played five games with the Hurricanes in 2011-12 and notched one assist and a plus-one rating. He spent three seasons at Cornell University, racking up 36 goals and 102 points in 102 contests. 8. Mark Alt, D: The Kansas City, Mo., native set career highs with five goals, 17 assists and 22 points in 42 games as a sophomore for the University of Minnesota in 2011-12. The 2010 second-round draft pick (No. 53) finished second on the team with 51 blocked shots and was tied for second among defenders with a plus-18 rating. The Gophers went 13-4-0 when the 6-foot-3, 202-pound blueliner recorded a point. 9. Danny Biega, D: The 2010 third-round draft pick (No. 67) will enter his senior season at Harvard University in the fall after striking for 10 goals, 35 points and a plus-14 rating in 34 games for the school in 2011-12. The 6-foot, 200-pound Quebec native was a 2012 ECAC First Team All-Star, in addition to being named the league's top defensive-defenseman. 10. Chris Terry, LW: The 5-10, 190-pound forward led the Charlotte Checkers with 43 assists and 59 points in his third season in the AHL. The 2007 fifth-round pick (No. 132) has 67 goals, 103 assists, 170 points and 166 penalty minutes in 235 career AHL contests. Prior to turning pro, Terry played three seasons with the Ontario Hockey League's Plymouth Whalers, producing 114 goals and 175 points in 253 games.